The coaches in this series represent the third stage of design during the L.M.S. days under Sir William Stanier. The simplified design is know as 'Period III' (1933 onwards) and the kit covers almost all types and lengths of coaches produced in this period. The 2mm scale kit consists of an etched floor, trusses and bogie mounts, white metal ends, aluminium roof profile, pre-printed sides, plastic ventilators, brass buffers, and a range of white metal fittings appropriate to the vehicle in question. You will also need a set of bogies. Etched bogies are available or for the four wheel bogies the Graham Farish Mark 1 coach bogies provide an easier build. The twelve wheel coaches required the etched six wheel bogies. The travelling post office kits follow the same design but the shape of the vehicles makes them more complicated to build. 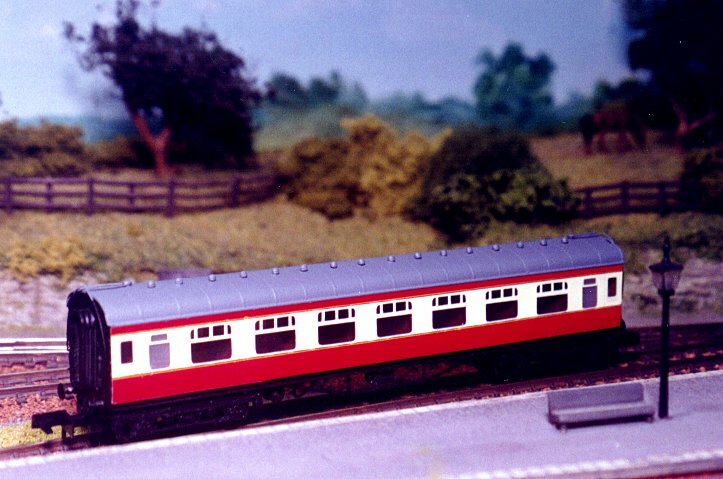 It is recommended that you build one of the simpler coaches before attempting a TPO vehicle. A subset of the same vehicles offered with crimson and cream sides rather than LMS livery sides. Crimson and cream livery, period 3, diagram 1863. Crimson and cream livery, diagram 1902. Crimson and cream livery, diagram 1900. Crimson and cream livery, diagram 1912. Crimson and cream livery, diagram 1917. Crimson and cream livery, diagram 1948.